Have you ever watched a movie that’s so bad it’s great? Perhaps you have one or two cinematic guilty pleasures that you just can’t stop watching, despite they’re being brazenly awful. If so, then Comic Cinema Remix (CCR) is right up your alley. Comic Cinema Remix is a monthly event where comedians sit down and watch a movie – a movie that people remember being excellent but is, in fact, head-scratchingly terrible – along with a live audience and provide hilarious commentary throughout the entire screening. “Don’t get us wrong,” chimes in CCR co-conspirator Chad Heft. “We love these movies – we just also love making fun of them!” And this love shines through in every Comic Cinema Remix show. Recent “Remixes” have included such classically terrific/awful movies as Commando, Footloose, Adventures in Babysitting and Independence Day, to name but a few. The 2015 Comic Cinema Remix season is shaping up to be even more shamefully amazing, with their first show taking place at the Egyptian Theater as part of the 2nd Annual Idaho Laugh Fest on January 10th – they will be lambasting the late 80’s Patrick Swayze classic Dirty Dancing. 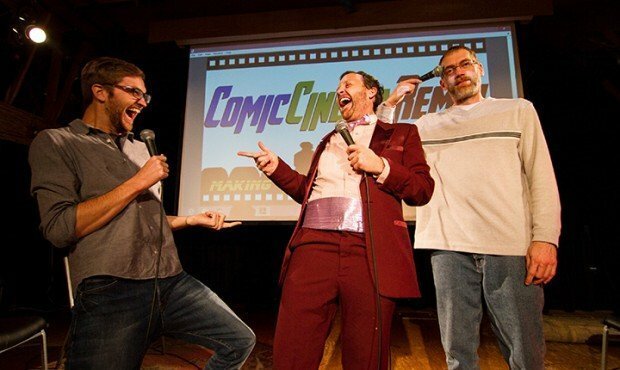 Comic Cinema Remix is the best recurring monthly comedy show in the Treasure Valley. CCR is second only to the Boise Classic Movie viewings at the Egyptian for providing audiences the opportunity for big-screen viewing of old favorites. However in addition to focusing on the lower, more terrible end of nostalgic cinema, each CCR event is also filled with riotous movie-themed drinking games, improvised comedy and raffles/give-aways that make each evening more than simply revisiting a trashy, old cinematic friend. With the exception of the Jan 10th show, Comic Cinema Remix currently takes place once a month at the Visual Arts Collective in Garden City. Each Comic Cinema Remix starts at 9pm, although with the ongoing shenanigans and a mid-way-point intermission as part of each event, people are encouraged to show up any time, regardless of when the film begins. The 2015 Comic Cinema Remix calendar will include such classics as Roadhouse, Short Circuit, Robocop2, and The Happening. With the exception of the Idaho Laugh Fest show at the Egyptian in January, all the CCR shows are 21+… however CCR is planning Remixes at all ages venues in the spring and summer of 2015, venues to be announced. For more information visit ComicCinemaRemix. com or Facebook.com/ comiccinemaremix.